Summer of Color 5 - Color By Number begins this week. I have participated the last two years and have had so much fun. This is truly a mixed media event. Last year there were people who did sewing, embroidery, canvases, art journals and much more. It was very cool to see the same colors used in so many different mediums. This is also an event that many people do with there children. There are Giveaways each week and the whole event is free. Be sure to check out Kristen's Blog Twinkle, Twinkle . In honor of Summer of Color 5, I decided to post this very colorful page I did in my art journal. I think I used every color of the rainbow. The flowers are cut using a Sizzix die and old encyclopedia pages painted with inexpensive craft paint. The background is a stamp from Club Stamp and Archival ink. The centers of the flowers are done with glitter clue. I really encourage you to participate in Summer of Color. I have been a crafter in many years so I have a lot of different supplies. I am thinking many of you may also have a lot of things you haven't used. Why don't you give Summer of Color a try? You could use some of your stash! sounds like a fun creative thing to be a part of! lovely page and love those flowers. Thank you so much for playing with the Mixed Media Monthly Challenge and celebrating our first birthday!! Love your encyclopedia paper flowers! And your summer colors are SUPER fun!! 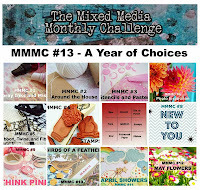 Thank you so much for playing and celebrating with us at The Mixed Media Monthly Challenge!! Beautiful colourful piece!! Love how you did the flowers! Thanks so much for adding it to our challenge at Mixed Media Monthly!! 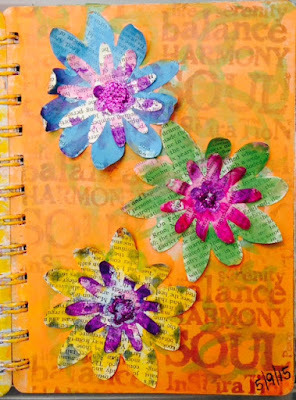 What a fun journal page, love the colorful flowers! Thanks so much for playing at the Mixed Media Monthly Challenge. Just beautiful. Thanks for joining the Mixed Monthly Challenge! Such a bright, summery art journal page! Love the flowers and the text in the background!! 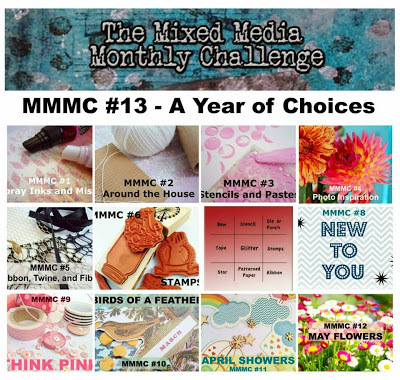 Thanks for celebrating with us in this month's Mixed Media Monthly Challenge!